Florence Foster Jenkins was the most famous, though untalented, soprano in twentieth century America. Her extraordinary story is now a film directed by Stephen Frears starring Meryl Streep as the indomitable Florence Foster Jenkins and Hugh Grant as her husband/manager, St. Clair Bayfield. In this full-length biography tie-in to the film, Nicholas Martin, the scriptwriter, and Jasper Rees take a deeper look at her life and times. Born in Wilkes-Barre, Pennsylvania in 1868, Florence adored music, but her wealthy father refused to allow her to study in Europe. In 1909, she inherited a considerable sum of money when her father died. It was then that she began to take singing lessons, vowed to become a great soprano and met St Clair Bayfield. At seventy six, after a lifetime supporting classical music societies and giving self-financed recitals, she gave a solo concert at Carnegie Hall that drew Cole Porter, Gypsy Rose Lee and other luminaries to the sold-out hall. It was a night to remember. Florence felt she had triumphed, but the crowd roared with laughter. After a lifetime of singing to entertain others, she didn't know the one thing that everyone else did and that St. Clair Bayfield kept from her: she had a terrible voice and couldn't sing a note. 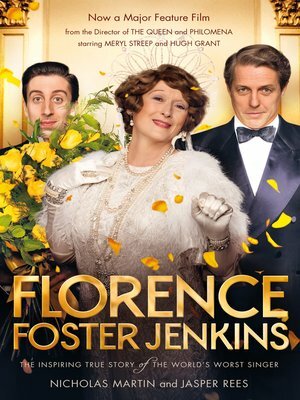 Florence Foster Jenkins is the book everyone will be reading after Meryl Streep brings this unintentionally funny and ultimately heartbreaking American woman to life.